Residents of towns and municipalities are constantly seeking out government websites to figure out information like environmental policies, drivers license details, campaign finance options and more. However, the average person probably doesn’t think at all about government websites…until they absolutely need them. Well, it turns out thousands of people need these websites each day, so it’s essential for government organizations to connect with the people they serve. With nationwide budget cuts, it’s reasonable for cities and towns to look for a more affordable website solution. However, they also need to keep the quality functionality that everyone expects when going to a government page. Therefore, a government WordPress theme is a great fit, considering they are often low maintenance, easy to setup and low-cost options. 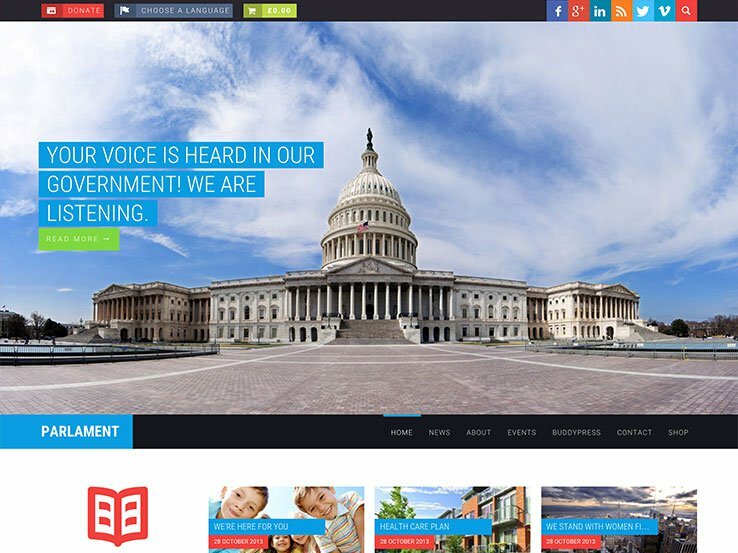 If you’re interested in learning more about the best government WordPress themes, we encourage you to read further and bookmark this page for future reference. 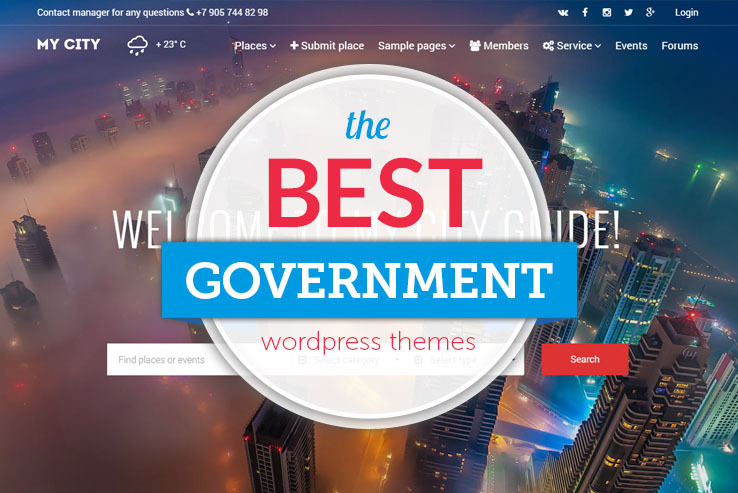 What Makes a Quality WordPress Government Theme? Obviously, you’ll want one that has a responsive design, but what else should you expect? Some of the themes below offer virtual city tours, making it ideal for those who are more of a service based company or organization. You’ll also find shortcodes and icons for talking about services and government events. Calendars are great for keeping people in the loop about recent happenings, and a beautiful blog is ideal for announcements and news. We also like themes with sliders, since these tools are great for grabbing attention when users stop by. 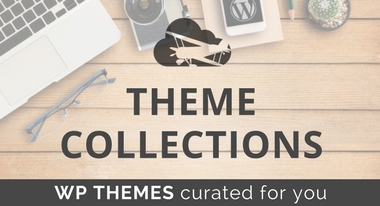 Finally, you’ll receive well-coded themes and quality support from each of the development companies that make these themes. You’re in good hands, so keep reading to learn more about the top government themes. The Liberty theme provides a great solution for highlighting the issues in your town and keeping people in the loop about the events and news happening around them. It comes with an elegant and professional design along with nifty features such as custom pages for issues, an events calendar for managing your events, and a newsletter system so you can easily reach people through email. You’ll be able to receive and manage donations from your site and since the template is eCommerce ready, selling your merchandise will be easy. 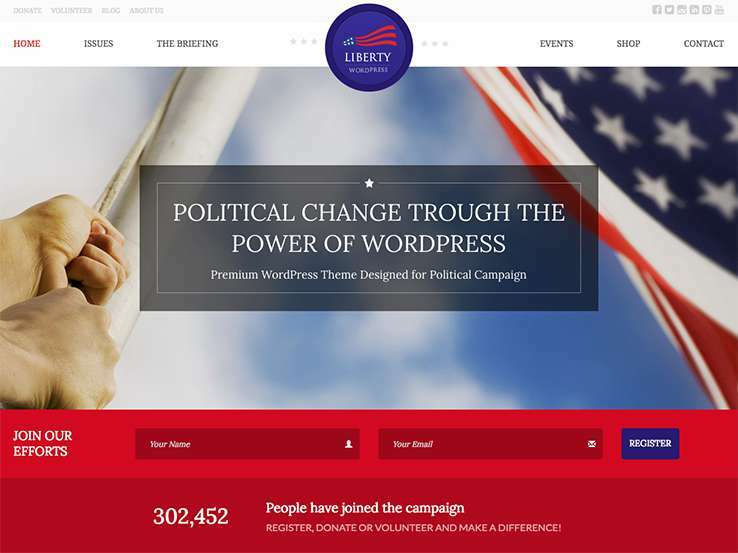 Besides, the Liberty theme features a beautiful blog for sharing news and announcements, and social media integration so you can easily connect with people on Facebook, Twitter, and other social networks. 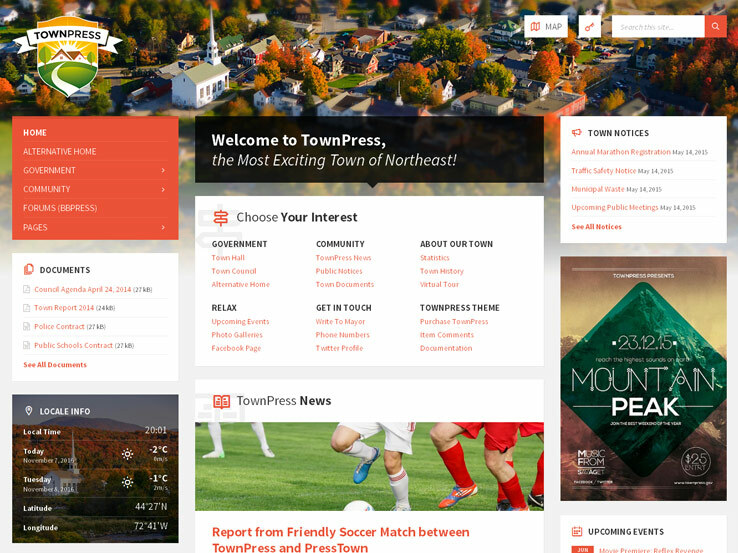 The TownPress WordPress theme serves as the ideal theme for small towns and villages. A local weather widget ensures that the people in town are updated with the weather conditions, while the upcoming events module enables you to share the word about food drives, community functions, and town hall meetings. Documents, galleries, and forums are all possible through the TownPress theme, and the bbPress plugin integrates perfectly for constructing a community around your website. Think about how many people will want to come to your site to discuss the pressing matters in town. The entire template has translation settings, all of which bring your town together since everyone can understand what is being said on the website. It’s also bundled with the Visual Composer plugin, which gives you a drag-and-drop interface with wonderful support. Simply move elements like buttons and sliders wherever you want on the page and quickly preview without touching a line of code. This is a no-nonsense design, using a large image in the header and a spot for you to place your logo. Users can click on the Map button to see where they need to go during the day and the search bar improves the navigation throughout the entire site. You can easily display important town notices and a wide range of interests and categories are organized for town people to move towards the page of their choice. The blog has various page formats, so you can develop articles with videos, audio, and galleries. The blog is a huge part of a government website because everyone in town is going to follow along with local developments. A newsletter subscription form increases the amount of people on your email list, and it integrates with services like AWeber and MailChimp. Use the social media buttons to send people to places like Facebook and Twitter. This is particularly important in small towns because more people are likely to get their updates from Facebook than your website. So, post articles and news on your Facebook page. All of your government contact information is displayed nicely in the footer, but you do have the option to distribute the information on other pages. 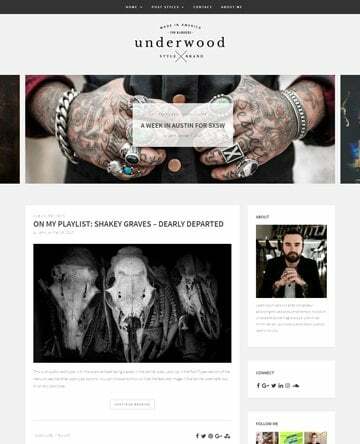 Overall, the TownPress WordPress theme comes in handy for the smaller towns with creative people involved. It looks warm and inviting, and the website loads fast. 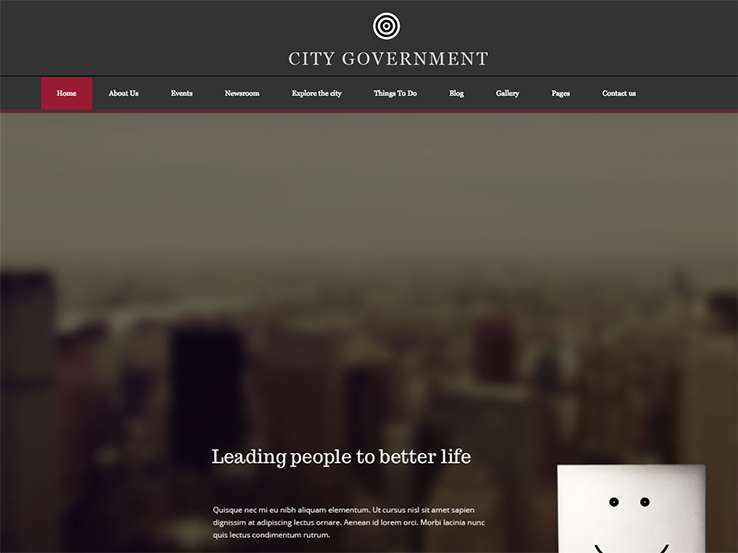 The Citygov WordPress theme provides a modern and functional choice for cities and municipalities. It actually looks similar to a standard business information website, with icons, columns, and a large header for recent news and events. So, if your government is in need of a professional makeover, the Citygov theme might be right up your alley. 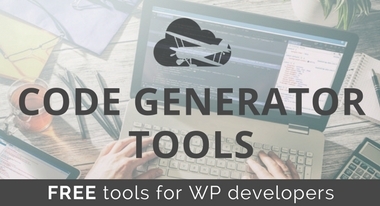 The unique shortcodes can be copied and pasted anywhere on your site, generating items like accordions and buttons, all without touching a line of code. The Visual Composer plugin comes with the theme and it provides a stunning drag-and-drop interface for those who are either beginners or advanced users. Advanced developers generally enjoy the speed in which they can design, while beginners like how they don’t have to go into the source code. 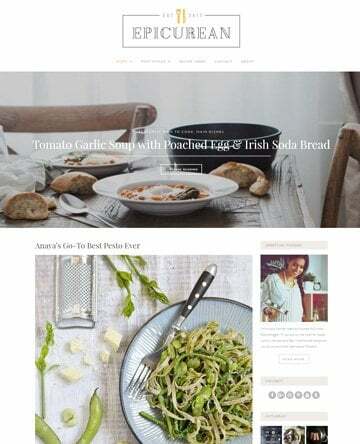 This is a fully responsive theme, meaning that anyone with a tablet or phone can bring up the site and still see all of the content clearly. 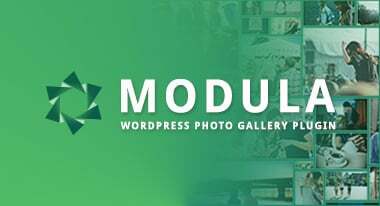 The theme is compatible with the following premium plugins: Revolution Slider, Essential Grid, Visual Composer, and PO Composer. Keep in mind that some of these premium solutions are included with the theme, while others you must pay for later. A search bar resides at the top of the page and a beautiful full-screen slider moves through a wide range of images that you upload from the backend. 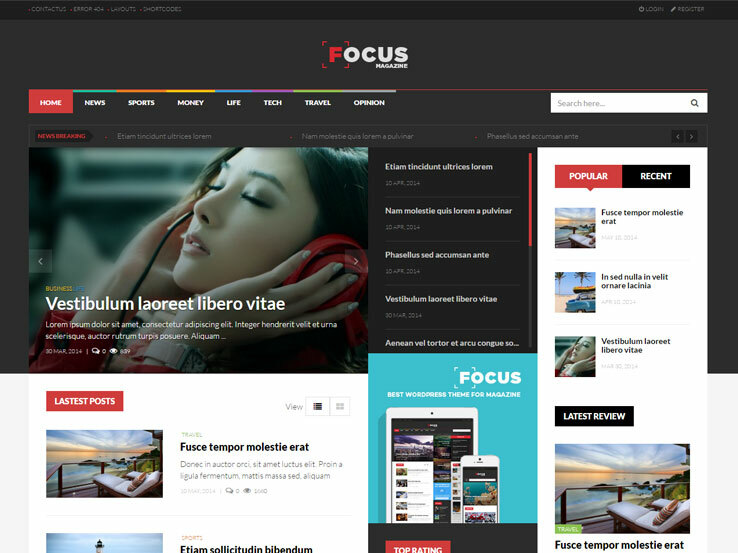 The theme is easy to install and update and it has two homepage layouts for differentiating from the start. Quite a few translation tools allow you to reach out to other people in your community. For example, a large city like Chicago has tons of Polish, Latino, and German communities. These people most certainly want to be able to understand what’s written on the government website, so this theme does the trick. The WooCommerce plugin integrates just fine with the Citygov theme. Not every city is going to have an online shop, but many governments use it for drivers’ licenses and other items. The media content manager is a little easier to use on this theme, as opposed to the thousands of other themes on the market. Overall, we like the Citygov theme because of its clear messaging, professional styling, and various tools on the backend. CuteChurch is packed with features perfect for local governments with their preset demo CuteMunicipality. A high functioning calendar eliminates the problem so many municipal sites have with awkward schedules. An additional sidebar spotlights upcoming events and links to detailed information about the happening. This theme also understands that people can’t attend every important occasion and has a menu option for Lectures, which is great for posting videos of important meetings and big celebrations. Former residents nostalgic for home might enjoy a peek at your 4th of July fireworks or Christmas tree lighting. There are more than 50 widget positions on CuteChurch for maximum creativity in design; the Customizer for changing colors and choosing from over 700 Google fonts also helps you tailor your site. One of the best widget areas is for showing your progress on various projects, such as funds raised or volunteers recruited. The Gzip and Minify Compression will keep your site running smoothly with fast load times users will appreciate. 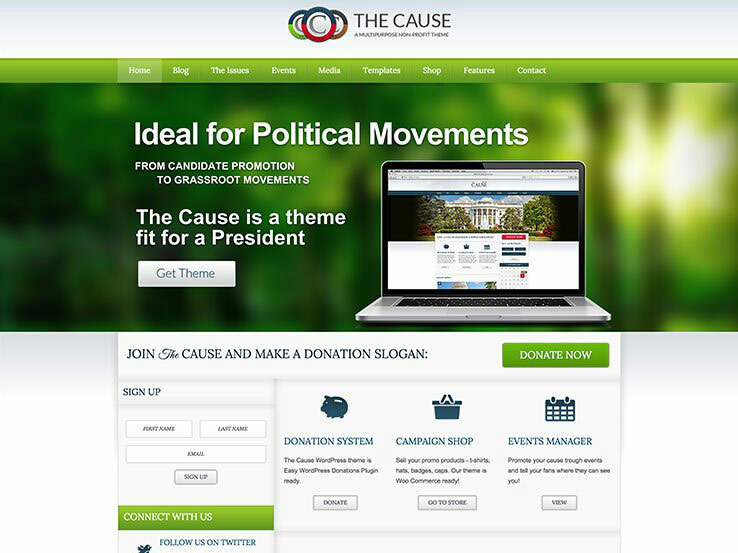 This theme also comes with demos specific to churches and politicians, making it a fantastic, multifunctional option. 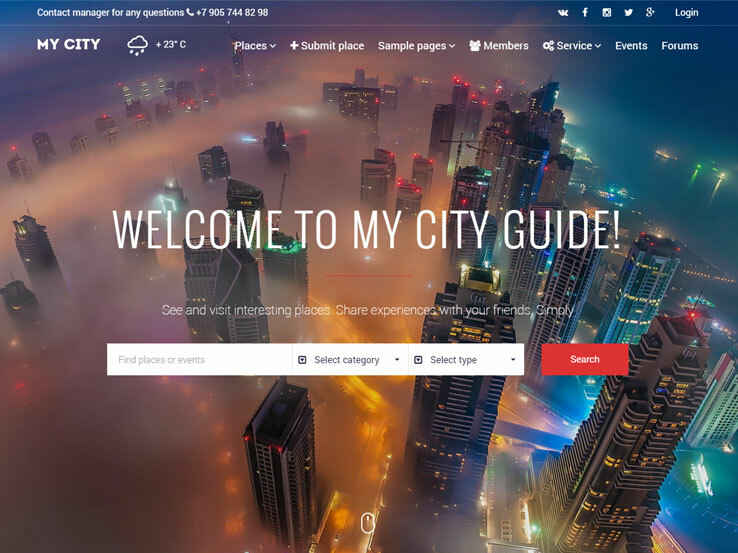 MyCity is a wonderful theme for helping visitors and residents alike enjoy your city. With this theme, you can build a guide to all the fantastic options your city has to offer. There’s an option to sort by categories, such as food, sports, or shopping, or a page that displays all your featured locations in a grid or list format. Integration with Google maps will then get them where they want to go. Local businesses can easily offer discount coupons and promotions on your site to increase their customer base and an option to affiliate your site with Uber and Airbnb will make visiting your city even more attractive. MyCity also offers very convenient features for residents such as recurring payments through PayPal to make bill paying easy. A forums page keeps you in touch with your citizens by allowing them to participate in productive discussions about important issues. A series of chart options, including a progress bar, pie or doughnut charts, and line or bar charts, effectively communicates how far your city has come toward reaching its goals. And options for video backgrounds and parallax effects ensure that your website will stylish and informative. Learning about your local government should be easy, not a mess of confusion. 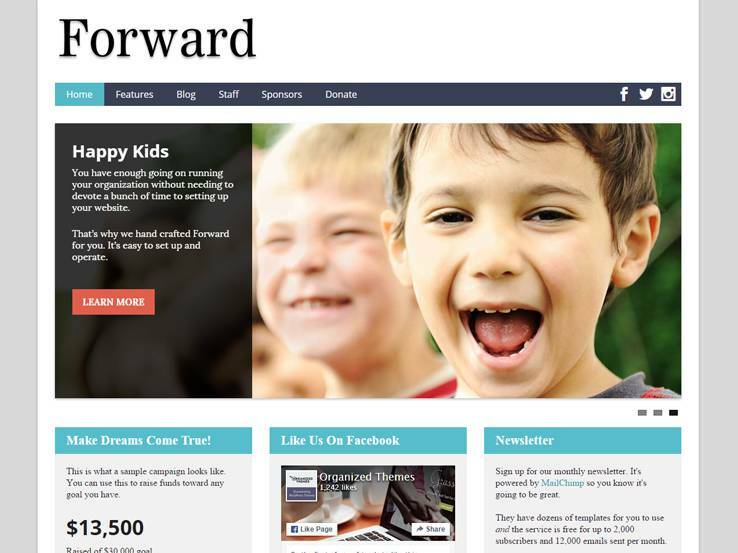 The clean style of the Forward theme will keep things simple while still giving you lots of options. The members of your government should be also well known and accessible; help facilitate this with a great staff directory. A photo and description introduces members and links to individual social media accounts invites visitors to learn more. For your official social media pages, icons are prominently displayed in the top menu bar and a Call to Action in the sidebar encourages visitors to “like” you on Facebook. Newsletter signup through MailChimp and an events calendar will keep residents further informed and government actions transparent. With Forward, you can add your own logo or city crest and choose colors and Google fonts that coordinate. Changes are live while you design your site without having to update to see each alteration. The Sponsors page is perfect for linking with partner organizations and with a WooCommerce plugin you can raise funds toward common goals. There are options for both selling products and collecting donations and with the Shatner – Name Your Own Price extension, supporters can pick the amount with which they are most comfortable. Website design couldn’t be simpler with Flawless, letting you get back to the important work of running your city. Video tutorials walk you through installing the demo page, using the New Page Builder, and setting up a blog, portfolio, or gallery. The GoodLayers Importer installs the demo site complete with widgets, sidebar, and footer to get you started fast. You can also make changes with the New Page Builder where you can choose from unlimited color options, three blog and portfolio styles, and sidebar width. It also has with a unique undo/redo function. This theme also comes with tons of shortcodes for all design elements plus FontAwesome to set sizes, colors, and drop shadows. To give your site some extra flair, set a YouTube video as your background or incorporate a Parallax effect, the speed of which you can set in the Page Builder. 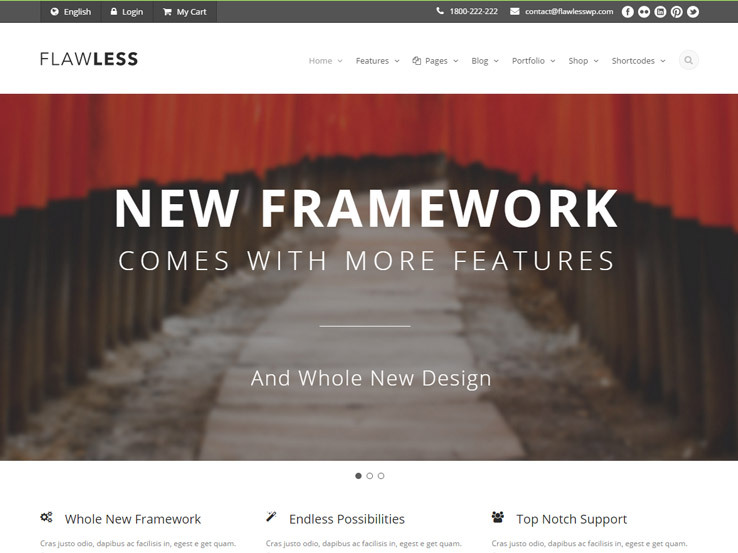 Flawless is translation ready and fully responsive to make your site accessible to an international audience and people on the go. The WooCommerce plugin has been redesigned to match the minimalist look of the theme while still offering the best in e-commerce integration. The City Government theme is both Retina-ready and responsive for the ultimate mobile interface. You gain access to Typekit, Adobe Edge and Google Fonts, which are all wonderful for branding your site and creating an atmosphere where you’re comfortable with customization. The event management system ensures that people can see what types of public gatherings your government is having and they update folks on dates, times, and details. 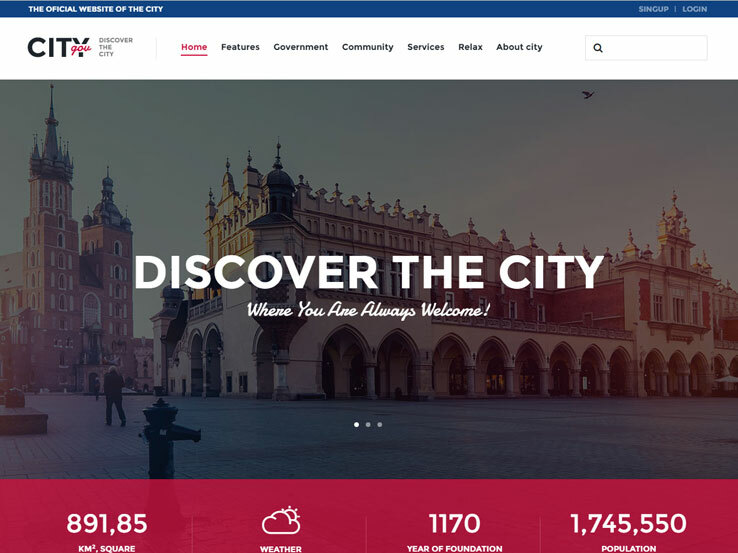 The virtual city tour is our favorite part of the City Government WordPress theme because it has interesting tools for showing users around the city without making them walk all over the place. This comes in handy when someone is new to the city or traveling there for work. An unlimited number of color schemes come along with your purchase and the Layer Slider supports high-resolution images without any problems along the way. Use the mega menu if you plan on having hundreds of pages on your website. A mega menu like this is generally used on eCommerce websites, but many government organizations are known to add lots of information on a website. This niche is one of the only ones that pretty much requires multilingual support. After all, multiple languages are bound to be spoken in one area that a government is located in. The one-click dummy demo import provides a solution for those towns and cities that want to launch in a short period of time. Filling in more relevant information is much easier this way since you aren’t starting from a blank slate. The logo resides in the middle of the header. It looks nice for branding and it sits right on top of the navigation menu. The slider is right below the menu and it includes a wide range of cool effects and animations. The overlaying text and buttons serve you well when trying to include calls to action and the search bar works great for those who know exactly what they’re searching for. A news ticker goes towards the top of the site as well, giving government officials a way to communicate breaking news to the public. Several social media buttons come with the City Government WordPress theme, meaning that you won’t have to go out and get a third-party plugin for the same functionality. In addition to that, a newsletter subscription form builds your email list along the way. 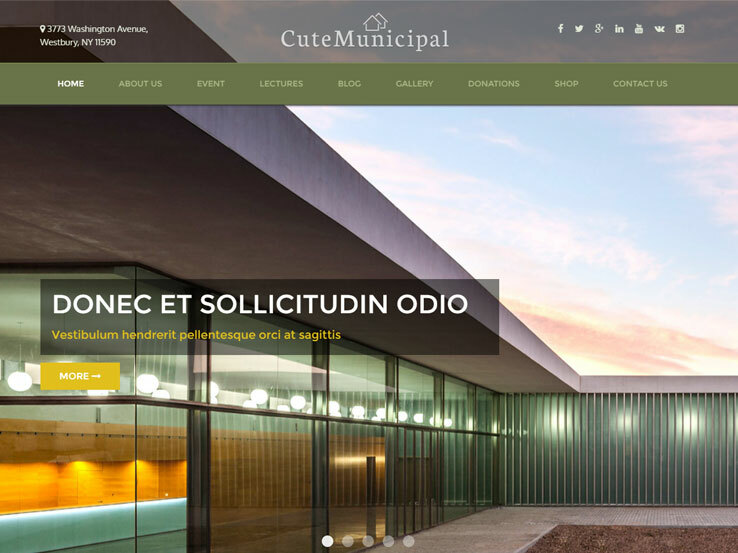 In short, the City Government theme is a wonderful option for a quick government website, but you do still have the ability to make it a huge site. 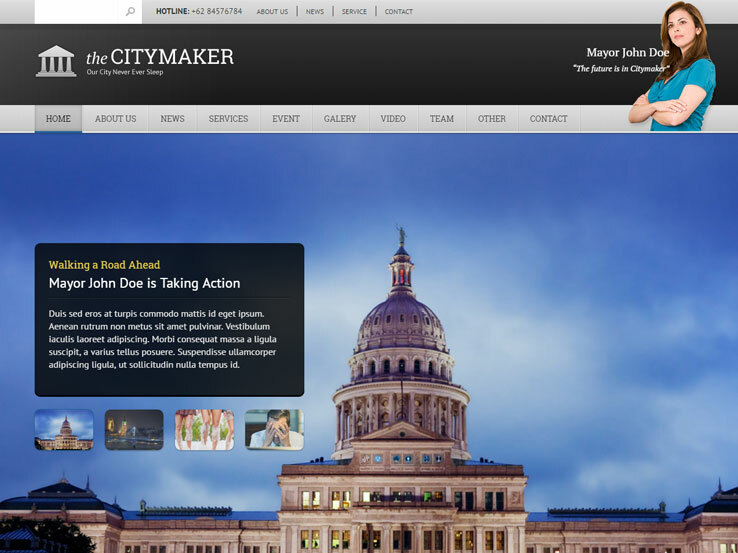 The Citymaker theme features a clean and professional design, making it a great choice for local government websites. It comes with many useful features such as an events module for managing your events, a news section to keep residents in the know about what’s happening around them, testimonials to display feedback, a staff page, and a section for presenting the public services you offer. In addition, the Citymaker theme includes other elements such as accordions and tabs for displaying large amounts of content and supports video so you can present your information in a variety of ways. 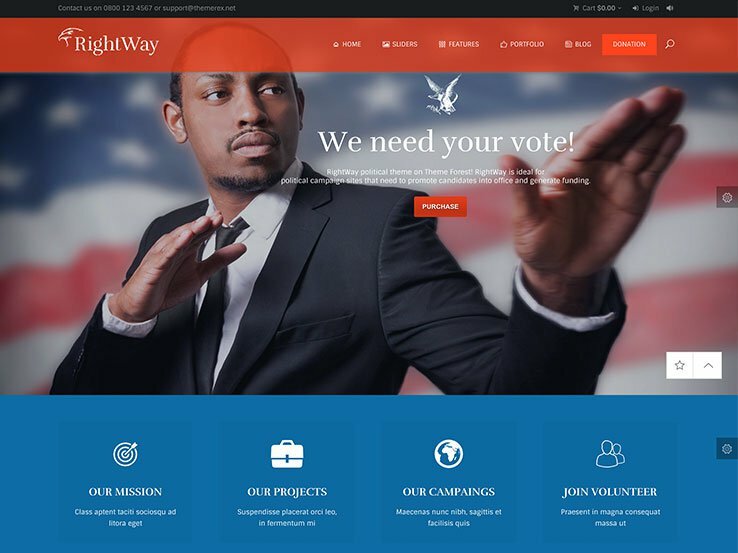 The possibilities are almost endless with the incredible Right Way theme, designed with politics and public figures in mind. 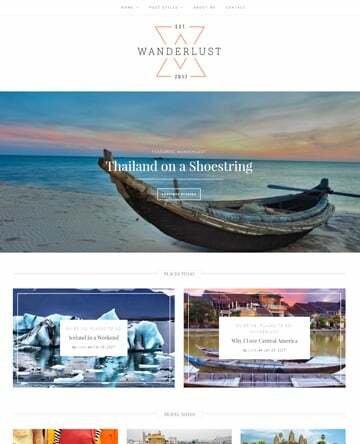 You can mix and match the unbelievable variety of choices such as the 11 homepage layouts, 5 header styles, 9 blog styles, and 15 portfolio options. There are also 8 slider styles including Swiper, Royal, Flex, and Revolution. A standout is the post slider that puts your most important content in the spotlight. More than 40 hover effects and the ability to create as many Parallax backgrounds as you want will really give your site flair. One of the most impressive features of this theme is the events calendar that lets visitor search by date or event name to simplify finding the information they want. Indeed your whole site will be a snap to navigate with the Ajax search mechanism. ThemeRex widgets for Flickr, Twitter and Instagram and buttons for other social media sites, including YouTube, will help you connect with your constituents in a multimedia fashion. 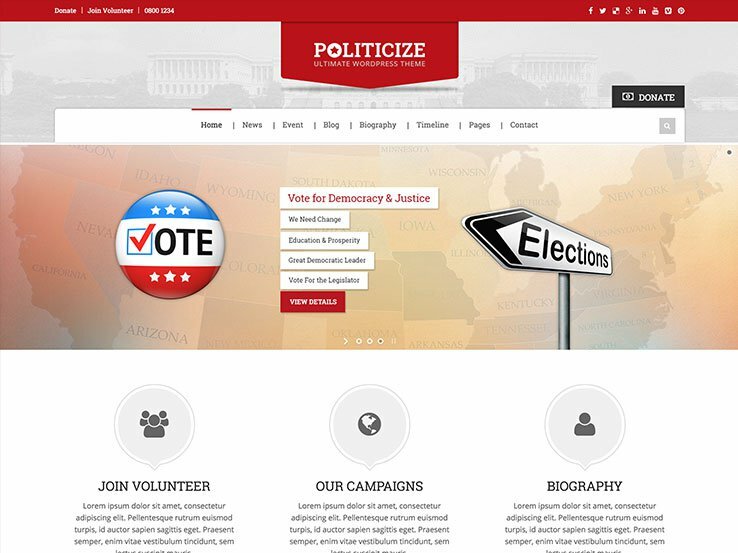 The Politicize theme is a fantastic choice for getting your citizens involved in community projects. The top bar on Version 1.0 has links to Donate or Volunteer and to various social media pages to grab visitors right from the start. Version 2.0 has a widgetized area below the top slider and menu bar which includes an option for volunteers and both versions have a Donate Now button. Posts include built-in social sharing so readers can share what they’ve seen and help you spread the word. This will be especially helpful if you opt to use the one-of-a-kind IgnitionDeck integration for Crowdfunding. The Donation manager will also help you reach your maximum fundraising potential. Politicize includes a timeline feature that you can use to teach visitors about the history of your city or to track the progress of a specific project. The Events manager and Ajax powered calendars make event operations easy and Newsletter management through Google Feedburner will help with publicity. Your site will also have a great look with more than 22 stylish options for background patterns, unlimited color choices, Font Awesome icons, and Parallax effects. And with the one click installation and Drag and Drop Page Builder, you’ll have a first-rate site up and running in no time. Your job is to serve your citizens and your website’s job it to make accessing information easy for them. The Parlament theme will help you do both, with its focus on functionality and effectiveness. This theme is lightning fast with a Google PageSpeed score of 94/100 for ultra quick downloading. The design is also super user-friendly with a top bar featuring important links to choose what language you want to see the site in, go directly to make a donation, and a shortcut to your Cart for online shoppers. Prominent, colorful social media icons also connect site visitors to all the communication venues you have to offer. Parlament is great for the site designer too. The easy to use Aqua page builder has an intuitive drag and drop interface and 18 adaptable blocks for customizing content. You can also use the BuddyPress plugin to manage member profiles, user groups, and messaging. 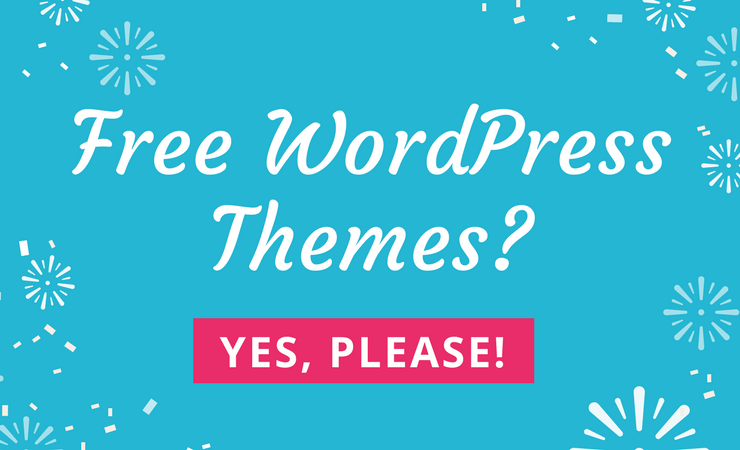 For even more options, this theme is compatible with Icy Social, Mailchimp, Contact Form 7, and WPML. Want a clean and modern website for your city or municipality? 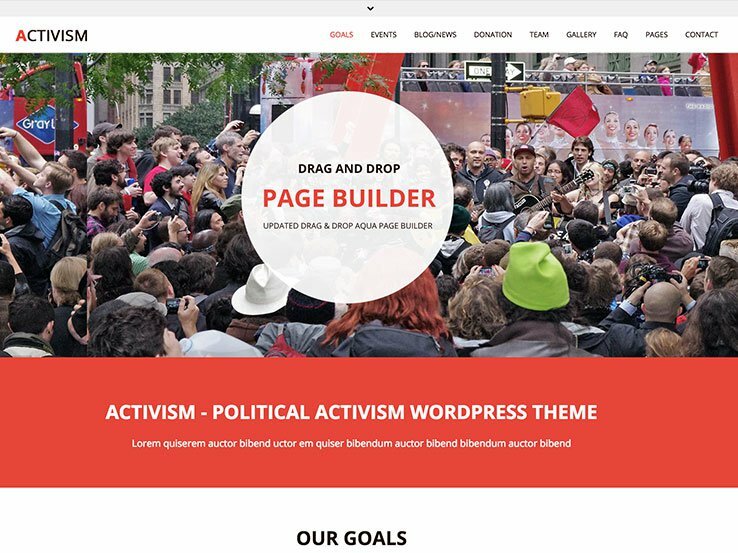 Try the Activism WordPress theme. It comes with endless possibilities, providing a wide range of useful features such as slideshows and galleries for showcasing images, an events calendar, and the ability to collect donations from your website. You can easily localize your site thanks to the included translation files. Also, there’s a blog for sharing news, Google map integration, a section for displaying you contact information and a contact form so people can easily get in touch with you. You’ll also find social icons for people to easily follow you and share your content on Facebook, Twitter, and other social networks. 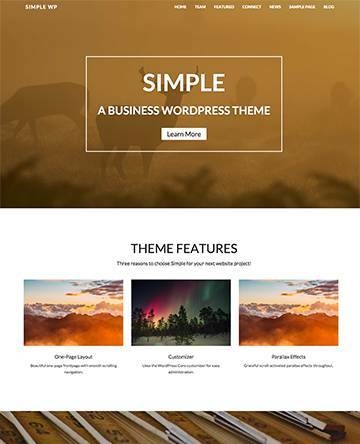 Kause is a beautiful and versatile theme designed and built by the Theme Canon team. It comes with an events module for managing your events, a forum where your community can engage, an amazing gallery with audio and video support, and the ability to fundraise and collect donations. 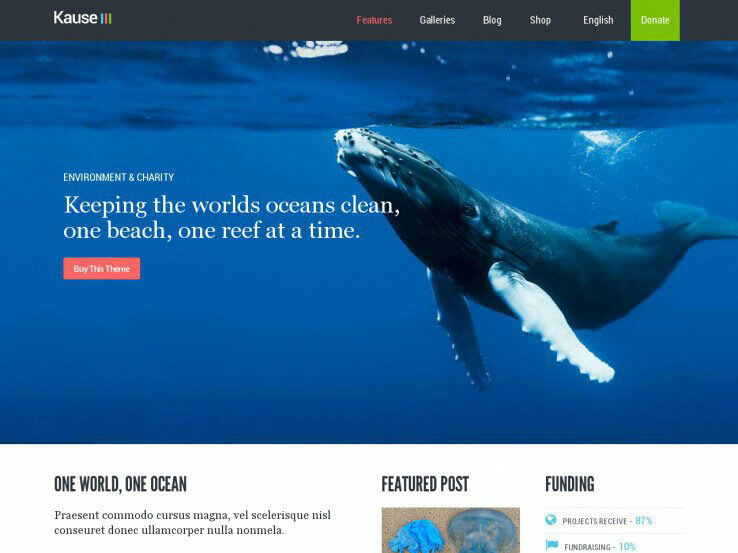 Besides, the Kause theme features an attractive full-screen slider for highlighting your top content, video support, and social sharing buttons to help get the word out about your site. The beautiful blog is great for sharing news and announcements, while the newsletter module makes it easy for people to subscribe and get your latest stories by email. Meet The Cause, a stylish and flexible WordPress theme with all the essential features and tools for successfully launching a government or city website. It features a beautiful full-width slider that will grab user attention, a donation system, an events manager, and eCommerce support in case you’d like to sell products from your website. The newsletter module makes it easy for people to sign up and receive updates via email, while the clean blog is great for presenting news. Furthermore, the theme comes with a Twitter feed for showing your latest Twitter activity and social icons for people to easily connect with you on social networking sites. It also comes with several page templates, so you can easily create pages for biographies, testimonials, FAQs, and more.